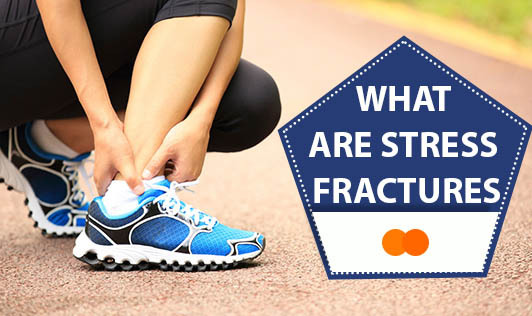 Stress fractures are tiny cracks in the bone that is caused by repetitive application of force, often by overuse, such as, repeatedly jumping up and down or running long distances. These are common in weight bearing bones of the lower leg and foot. Stress fractures can also arise from normal use of a bone that may have been weakened by a condition such as osteoporosis. The most common sign of a stress fracture is pain associated with activity which is usually predictable. There may be a tenderness that usually originates from a specific spot and decreases during rest. One may also experience swelling around the painful area. • Have foot problems such as flat feet and rigid arches. • Involvement in sports such as basketball or tennis. • Irregular or absence of menstrual periods. Osteoporosis. It may take several months or longer for the stress fracture to heal. In the meantime, get enough rest and use ice packs to reduce swelling and relieve pain. Resume activity only with your doctor's consent. Contact your doctor if the ache becomes intense and persists even at rest!